An Egyptian man accused of hijacking a plane and diverting it to Greek Cyprus has been sent back from the Mediterranean island to his homeland after a two-year extradition battle, officials said Sunday. Seif al-Din Mohamed Mostafa, 61, allegedly used a fake suicide belt to seize an EgyptAir airliner from Alexandria to Cairo in March 2016. "(Greek) Cypriot authorities yesterday handed over to the Egyptian authorities, Egyptian detainee Seif al-Din Mohamed Mostafa," a statement from Greek Cyprus's justice ministry said. 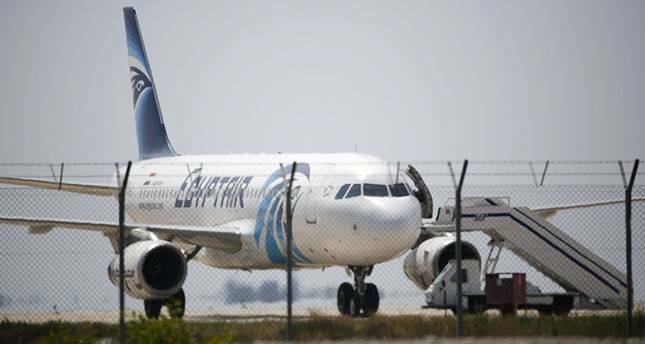 Officials at Cairo airport confirmed his arrival amid tight security late Saturday. State-run Al-Ahram newspaper reported that prosecutors in the city of Alexandria on Sunday ordered him held for a preliminary 15 days in custody. Mostafa fought his extradition on the grounds he would not receive a fair trial in Egypt, but the Greek Cypriot supreme court dismissed his appeal against being sent home last year. Mostafa's request for asylum was refused as Greek Cypriot authorities deemed him a "perpetrator of serious crimes." During hearings, Mostafa described himself as a liberal who wanted democracy for an Egyptian people subjected to "abductions, disappearance, illegal detention and extrajudicial killings." The justice ministry in Greek Cyprus said Mostafa eventually "expressed the wish to go back to his own country" and withdrew an appeal to the European Court of Human Rights that stayed the extradition. According to Greek Cypriot police, Mostafa gave a voluntary statement admitting to the hijacking, which ended peacefully with his arrest.